Directions: The applicant for an Arkansas permit must be at least fourteen years of age. To obtain the permit, an applicant must pass the knowledge test and vision test. The knowledge test for your permit is based on information contained in this driver’s manual. To pass the knowledge test, you must demonstrate a basic understanding of Idaho traffic laws. The test is a 25 question multiple choice test. Each question is displayed along with three possible answers. You must answer at least 20 questions correctly to pass the test. When pavement is wet, reduce your speed. The road ahead winds in a series of turns or curves. Warning signs are usually yellow with black markings. 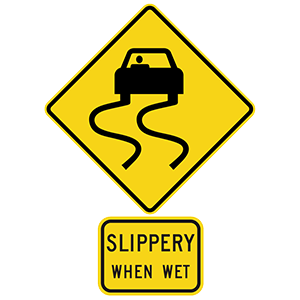 This sign warns drivers that the roadway will be slippery when wet and they should reduce their speed accordingly. Only the left outside mirror. Over their left or right shoulder. Only the inside rearview mirror. Your vehicle's blind spots are the areas that you cannot see in your mirrors. Look over the appropriate shoulder to check your blind spot when changing lanes. They are driving closely behind another vehicle. Windshield wipers are in use. They want to get somebody's attention. Arkansas law requires drivers to turn on their headlights when windshield wipers are needed. Low beam headlights should be used under rainy, snowy, or foggy conditions. Alcohol slows your reflexes and reaction time, reduces your ability to see clearly, and makes you less alert. As the amount of alcohol in your body increases, your judgment worsens and your driving skills decrease. You will have trouble judging distances, speeds, and the movement of other vehicles. You may drive more slowly than the posted speed limit, based on road conditions, but it is illegal to drive any faster than the posted speed limit. Some conditions which require reduced speed for safety include approaching curves or hills where visibility is limited, driving on slippery roads, and driving on roads where animals and pedestrians are present. The vehicle to arrive first has the right-of-way. The vehicle to arrive last has the right-of-way. Drivers should always offer to let other cars proceed first. At intersections with stop signs on all corners, cars should proceed in the order that they arrive. Come to a complete stop and yield the right-of-way to any vehicle that arrived to the intersection before you. Passing is permitted from the left. Passing is permitted from the right. Passing is not permitted from either direction. Yellow lines separating lanes of traffic indicate that traffic is moving in opposite directions. Double solid lines indicate that passing is not permitted from either direction.